Mobility – defined here as the ability to move with ease throughout the geography of our community – is supported by more than our personal cars. What types of vehicles can help make it easier to get to and from the places we want to go? What emerging fuels and technologies can be deployed? How does the way the community is built impact mobility? 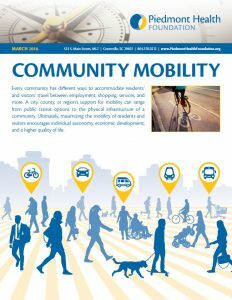 A new publication from Piedmont Health Foundation gives a quick overview of community mobility. Written by Public Health and Political Science Intern from Furman University, Sean Rusnak, this document takes a look at the many ways we can promote mobility for all.